Our residential painting experts create positive emotions through new, updated colors throughout your entire home. We at Wall 2 Wall Painting love what we do and as a result, we’ve never had to work a day in our lives… so to speak. We love our clients and they love us as well. Our clients keep coming back and referring us to their family and friends, which is the biggest compliment they can give us and in return we take great care of them. By giving our clients great customer service, a warranty on their finished projects and superb quality we have amassed many satisfied homeowners throughout Escondido. We take great pride in our work and love seeing the transformation of a fading, worn down house into a beautiful and stunning home with great curb appeal. Our clients know they can count on us every time they call. Whether it’s for an estimate, concern or even something that wasn’t caught at the final walkthrough, we are always there with a big smile ready to assist. Give us a call and we will not disappoint you. We’ll be happy to receive your call. 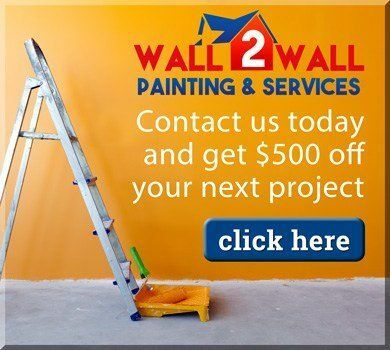 Here at Wall 2 Wall Painting & Services, our professional Escondido house painters work with and for our customers to help them turn back the years on their residential or commercial properties. Our Escondido house painting experts will revitalize and revamp your space, using high-quality painting and the best available products. Whether you need us for basic overhaul services like interior and exterior painting, drywall repair, our Escondido painting crew will get the job done cleanly, properly and promptly, exceeding any and all of your expectations in the process. As local Escondido painting contractors, we know and have just what you need. We offer several services including interior and exterior painting, epoxy flooring, and more! Would you like to give your Escondido home a more welcoming presence? Or your business a crisp new, attention-grabbing presence? Would you like to increase the worth of both? We can help you achieve those goals. Our dedication, tireless customer service, and hard work will be yours; we will provide you with a quality job that will last for years to come, and without any need for you to break the bank. Our Escondido Painters have helped renew the look and feel of hundreds of residential and commercial properties. We are fully licensed and insured. We have an A+ rating with the BBB and are EPA Certified. Our CA license number is 945269. Learn more about our Escondido painters here. This is a placeholder for the Yext Knolwedge Tags. This message will not appear on the live site, but only within the editor. The Yext Knowledge Tags are successfully installed and will be added to the website. We proudly provide our services to San Diego along with other nearby areas such as: Carlsbad House Painting, Carmel Valley House Painting, Del Mar House Painting, Escondido House Painting, La Jolla House Painting, Mira Mesa House Painting, Poway House Painting, Rancho Santa Fe House Painting and all other surrounding areas.